From the main screen of the app, select the category and item within that category. When you select an item that has modifiers, a set of buttons with modifier choices will appear. Apply all necessary modifiers, and then hit Home or the category button of the next item. If putting the order on hold, follow the steps in the Hold Order Section. If ready to process payment, follow the steps in the Payment Section. Before finalizing a sale, you can adjust the quantity, amount, add a discount or choose tax amounts. These can be added to the entire sale or by line item. Tap the item you'd like to edit. Use the + and - buttons to adjust quantity of an item. Edit the price in the text box to alter the price. 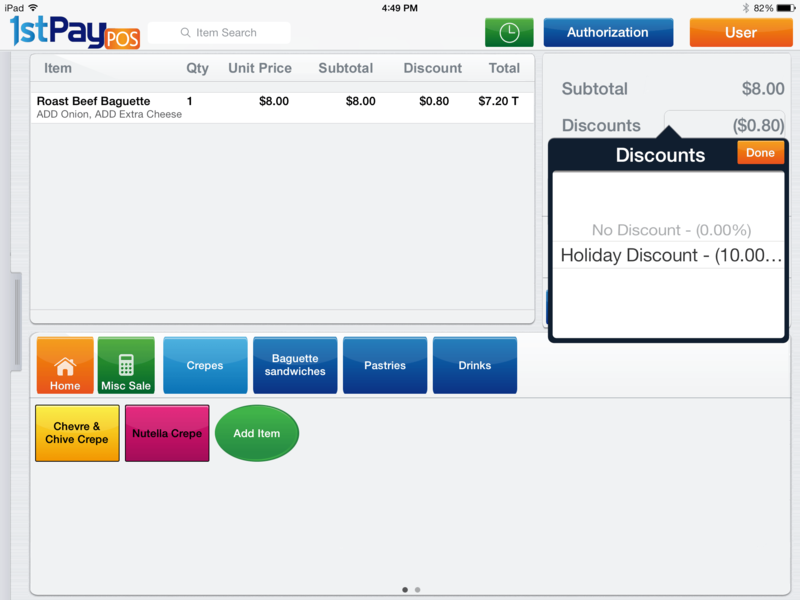 Discount: Tap Discount and select the discount reason. 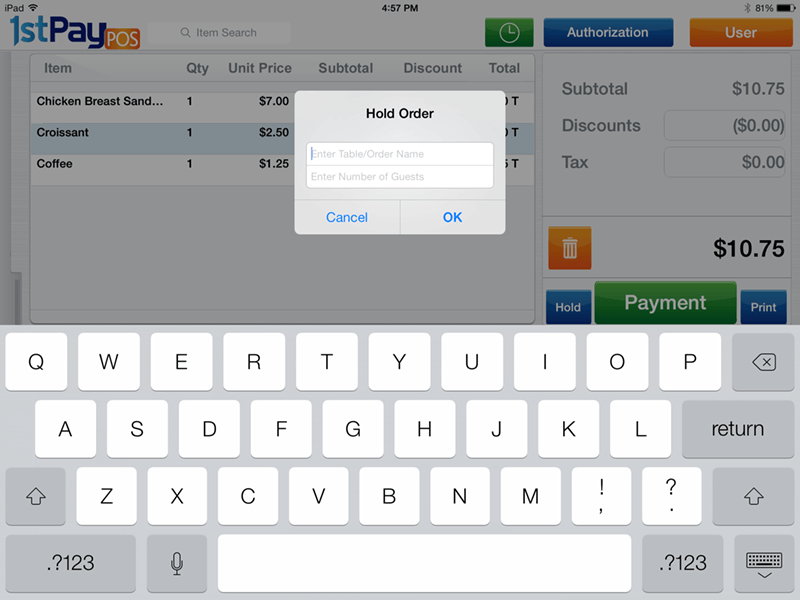 Tax: Tap Tax and select the tax percentage. The tax percentage cannot be changed within the app, but the merchant can have several tax options set up in the portal. The Hold button allows the merchant to place sales on hold and retrieve them later or add items to it. The sale that is on hold will appear at the bottom of the screen. When ready to place order on hold, tap the Hold button, to the left of the big green Payment button. A screen will appear asking for the Table/Order Name and Number of Guests. 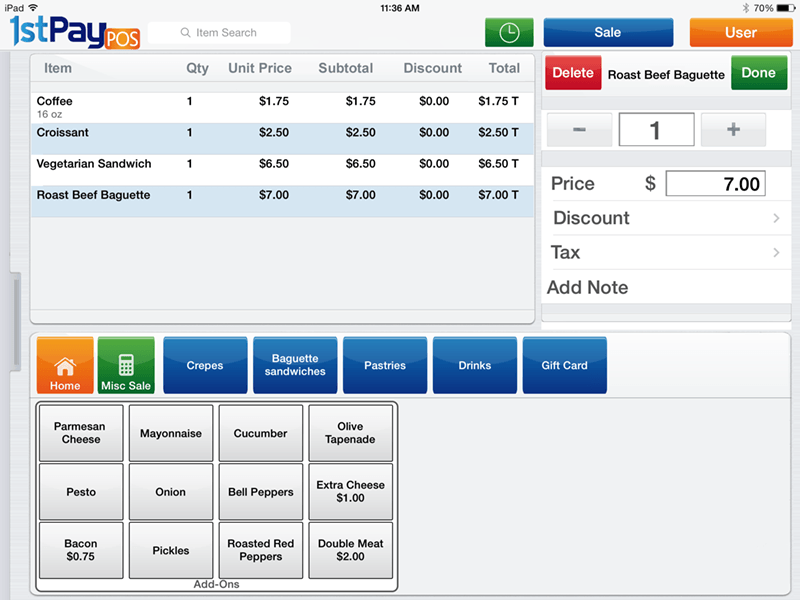 Enter this information and tap OK.
To pull a held order back up, tap the Table or Order Name displayed on the bottom left of the screen on all iPads. The Payment button allows the merchant to finalize the sale and choose the form of payment. Tap the green Payment button. You will be brought to the Payment screen. Select the appropriate payment method. a. Cash: Select amount or tap on Other Amount and press tender. b. Card: Swipe card or tap Card Number and press Charge. c. Gift Card: Tap on Gift Card. Gift Cards can only be keyed, even though the app may say they may be swiped. 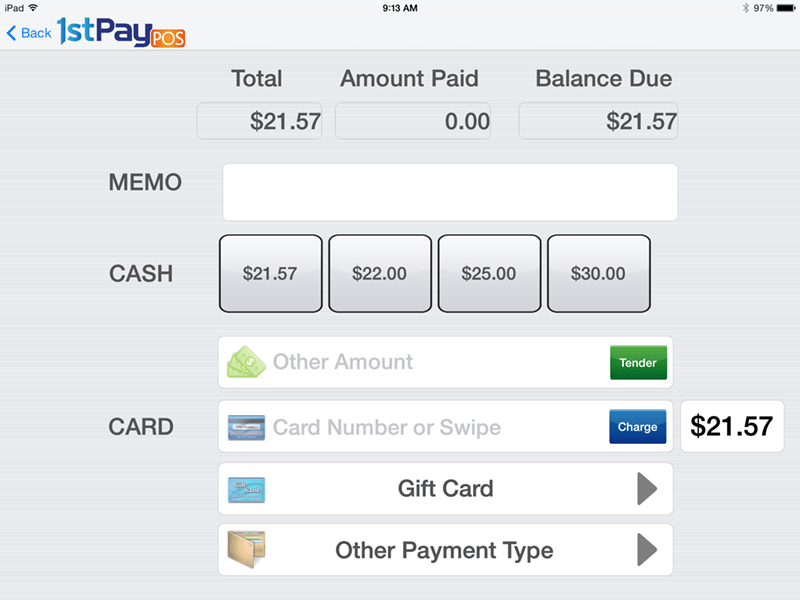 d. Other Payment Type: Select the payment type, such as checks, and enter the amount. You have the ability to split the payment among multiple types of payments. If the customer has a bill for $25.00 and would like to put $15.00 on the card and pay $10 in cash, enter $10.00 as the other amount in the Cash field, and then the updated $15.00 total will appear next to Card. Then swipe and complete the payment. On Retail accounts with tip enabled, after the merchant swipes or types in the card number, they will be prompted to add a tip to the sale. The merchant will need to tap submit to finalize the sale. If the transaction is approved, the merchant will have options of delivering the receipt either by printing, text message, email, or all. If it was a cash transaction, the change due will appear on screen.